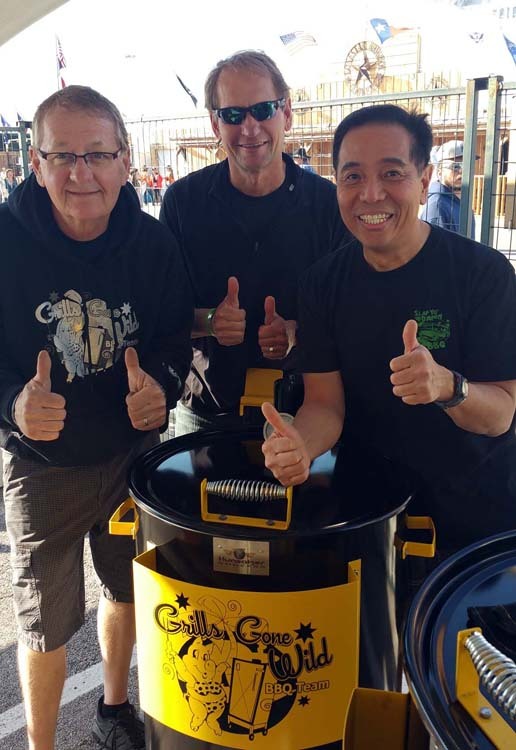 If you’re a serious barbecue competitor, you’ll likely have a checklist of contests you want do before you kick the bucket. Regardless of whether it’s the Jack Daniels Invitational, American Royal, King of Smoker Invitational, Memphis in May, Kingsford Invitational, or others, you always want to go as a competitor. For me, if I can’t compete then I’ll try to go as a judge, volunteer, or visitor, respectively. 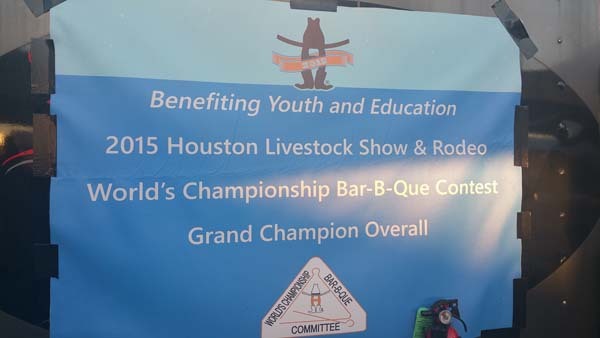 The Houston World’s Championship BBQ has been on my bucket list of contests to attend for a decade. 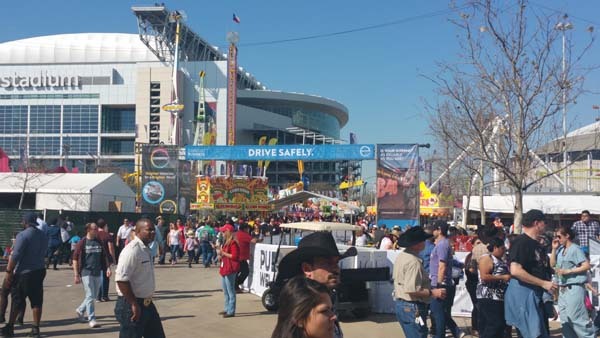 Since 1932, the Houston Livestock Show and Rodeo or HLSR has grown into a mega Texas 20-day event with 3 million visitors and 30,000 volunteers. 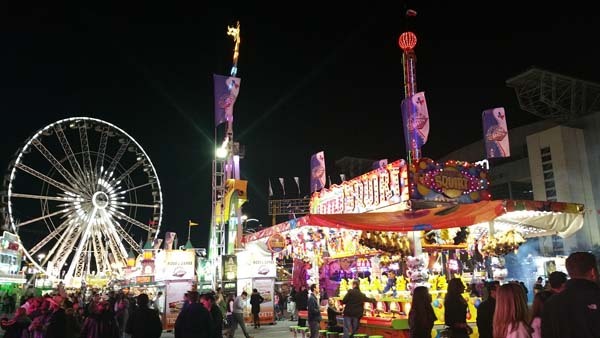 It’s become a huge part of Texas’ culture and the biggest livestock show in the nation and one of the state of Texas’ most anticipated events. 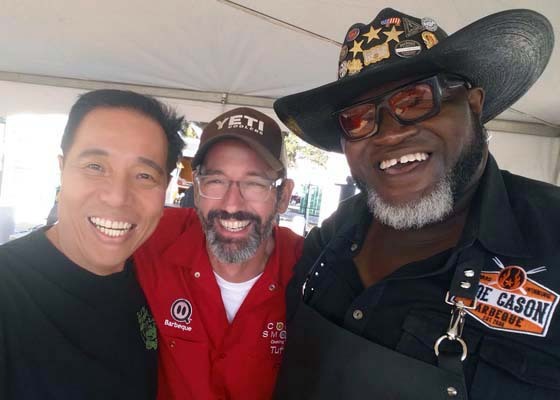 With such a supersized event, you’ll also need a supersized barbecue contest to crown a world barbecue champion. So in 1974, the Houston World’s Championship Bar-B-Que Contest, also simply known as “The Cookoff,” was born. 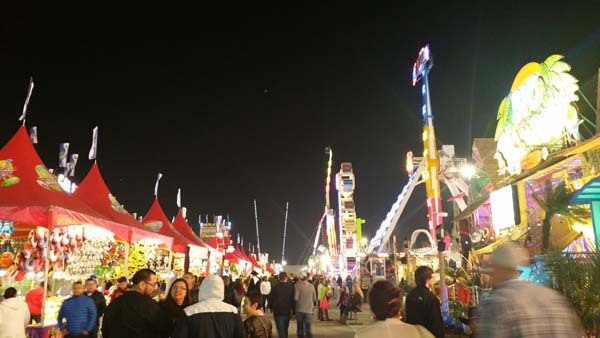 I’ve been trying to get into this event but the cost of entry and expenses (over $10,000) and reputedly multi-year wait list has made this contest out of my reach as it’s dominated by corporations who use the event as annual soiree for their best customers and employees. My fortunes changed when my Facebook Messenger window popped up with Doug Scheiding’s message. I did not know Doug but he wanted to talk to me. His phonecall changed my fate. Long story short, I was floored when Doug told me that he won the 2015 Houston World Championship. Wow! I was talking to a world champion. Amazingly, he told me that he won it using my Jailbird Chicken Rub as the sole seasoning on his chicken entry. 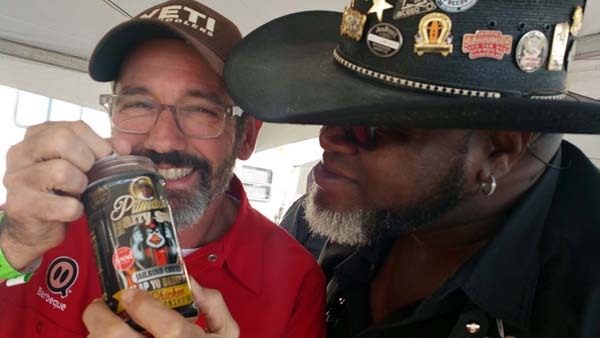 Tuffy and Moe checking out Doug’s winning Chicken rub! 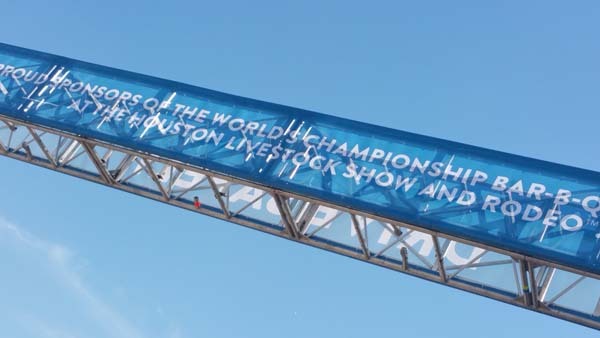 The HLSR is unique in that the Grand Champion is chosen by only one turn-in meat entry among brisket, ribs, or chicken. Coincidentally, this was the same chicken rub that helped me win the 2012 KCBS Chicken Team of the Year (TOY). I get lots of feedback that it’s helped many teams to 1st place. Now I have a bona fide world champion pitmaster to add to that list. Doug and his wife Jennifer are Rogue Cookers BBQ based out of San Antonio. With a background in aerospace, Doug and I hit it off right away since I used to fly 747s for an Asian airline in the early 80’s. Doug won the 2015 championship as headcook on Kerry Fellows’ team called Across The Track. Kerry is an attorney in Houston and hosts a large customer appreciation party annually at the Rodeo. 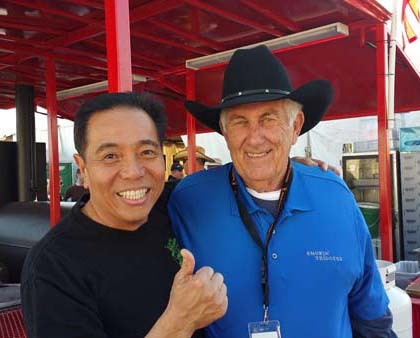 After Doug told me the good news with my rub, he invited me to join him at the 2016 HLSR on March 12, 2016. He would be cooking on Winners Row which is a fenced off area in a prime spot called Championship Corner. 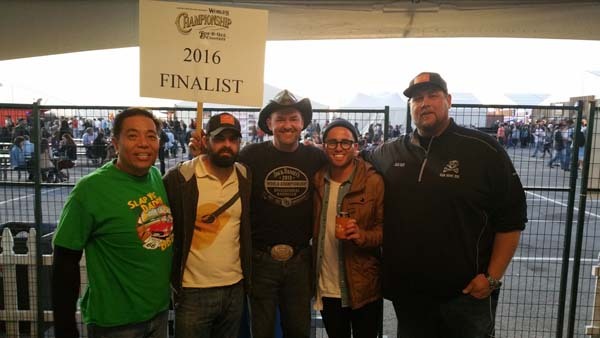 Joining the 2015 champion would be three more 2015 world champions including Tuffy Stone of Cool Smoke, winner of the 2015 Jack; Steve Nelson of Grills Gone Wild Iowa, winner of the American Royal 2015; and, Clarence Joseph and Carlo Casanova of Mama and Papa Joe’s BBQ, winner of the 2015 San Antonio Championship. I also got to hang out with three international teams in the adjacent fenced off area called the International Village. 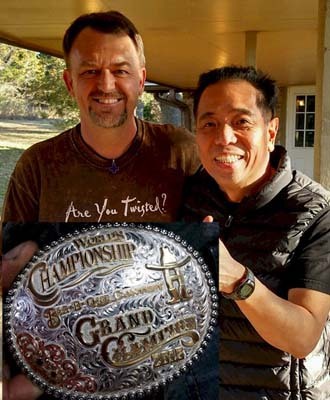 Imagine my surprise when I ran into Toby Shea of the British Bulldog BBQ team who is my former student when I taught classes for the British BBQ Association at his home in London. The two other international teams were BBQ Shogun from Japan and Red’s True Barbecue, UK. 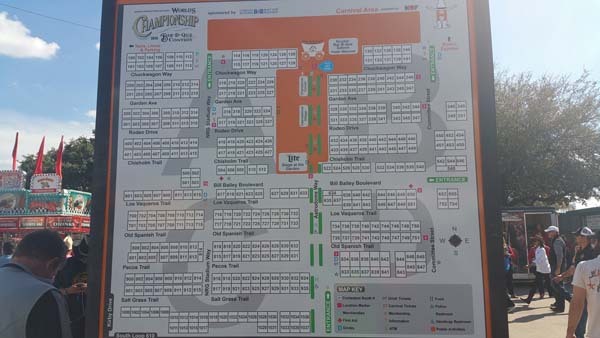 The vibe on the barbecue contest area side of the HLSR is best described as one ginormous carnival party city where each square on the team map is actually about 100 feet wide instead of the 20 feet at a regular BBQ contest. 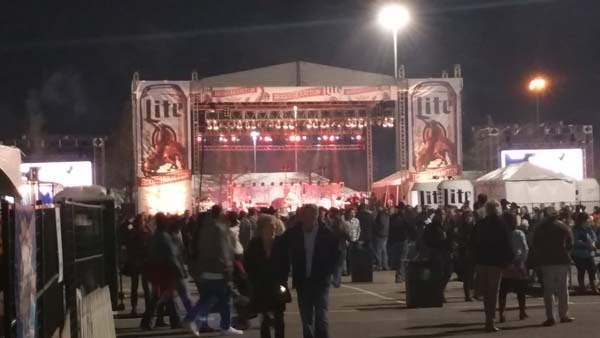 These jumbo sized lots are meant for hosting tent parties and over 300 teams were in attendance with live bands, theme parties, and wrist-banded guests. There were numerous police officers and private security guards since copious adult beverages were flowing freely at all the parties. It seemed like nearly every tent was an open bar. 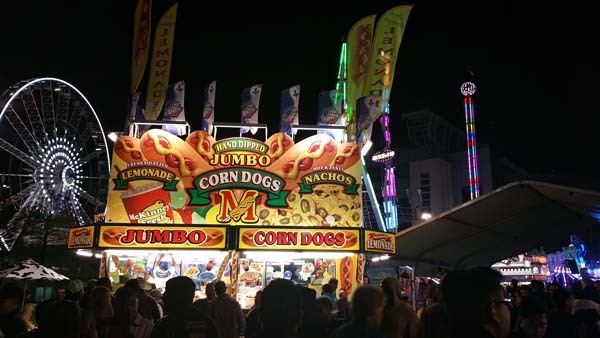 So, thousands of people attend the three-day barbecue fest to eat and drink all they want and then partying the night away. 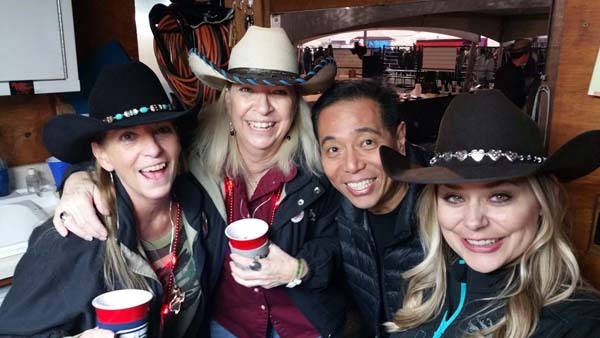 I’ve been to a few parties like the Dark Side at the American Royal but there are no parties like the ones at HLSR anywhere else in the world. It got rowdy after dark and I was glad the Winners Row teams were in a fenced off area as many were walking around very drunk. I was planning to kick back and play tourist but Doug got me to help cook the food for the Across The Track party tent #439 where Kerry was hosting a big party for 150 of his friends and guests. I recruited John Petreyko, the local Houston Traeger rep who dropped by and we both cooked the party meats so Doug could concentrate on the contest meats. Doug Scheiding getting into fighting form! I didn’t need to worry about going out to visit the teams as a long stream of friends started to drop by Winners Row to say hello including Robert Sierra of S&S Pit Crew, Brad Orrison of The Shed, Samual Barazza of the BBQ Texas TV Show, Cameron Treu of Bam Bam BBQ, Big Moe Cason, Bill Arnold West Texas BBQ rubs, and many others. 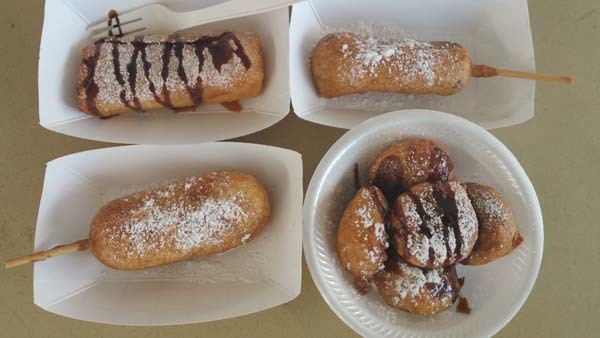 I also got to have a bit of carnival fun and enjoyed some fried Twinkies, Oreos, Snickers, Cheesecake coated in pancake batter. Definitely delicious and heart attack on a paper plate. 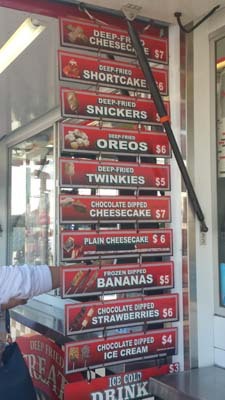 Each team at the HLSR is only allowed to turn in one meat, either Brisket, Ribs, or Chicken. To overcome this rule (and there were 70 pages of it), numerous teams cooked with the same team name but a numerical number such as Comcast Business 1, Comcast Business 2, and so on. This way, they could enter multiple meats to get a better chance of winning. The first, second, and third places for each meat category is determined and the highest scores determine 1st, 2nd, and 3rd overall places. In such a scoring system, it is entirely possible that the Grand Champion, Reserve Grand, and 3rd place winner at the HLSR could be chicken, chicken, and chicken. 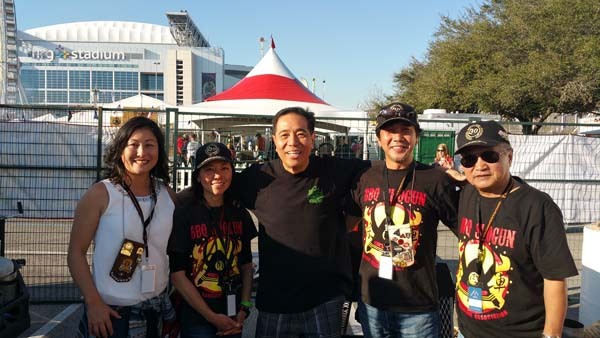 I met many fans of Slap Yo Daddy BBQ at the HLSR 2016! The raw meat for each team is tagged with a permanent metal tag by the officials before the team is allowed to cook. Each team is allowed two pieces of meat (e.g., two briskets, two ribs, or two chickens). The first meat is turned in during the first round and the second meat is turned in if the team makes it to the final round. For the world champions on Winners Row, the rules are different in that they are allowed to turn in all three meats. Doug’s chicken and brisket did not make the final round but we were ecstatic when his Ribs made the final round judging. A small party of judging officials with the final rounds placard will make a noisy appearance at your booth should you qualify for the finals round. We all attended the award ceremony to find out who would win the coveted title of Grand Champion and who was Best Chicken, Ribs, and Brisket. 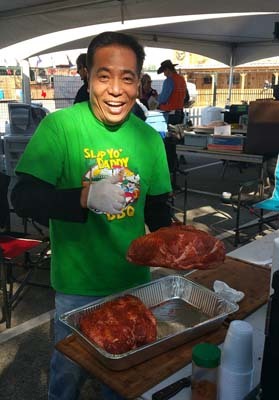 When the results were called, Bulldog Mountain Cookin’ Crew 2 was the overall Grand Champion, Xtreme Texas Cookers 4 won Brisket, Bulldog Mountain Cookin’ Crew 2 won Ribs, and Washington County Go Texan won Chicken. There were many other specialty winners such as Most Colorful Team, Most Unique Pit, Best Team Skit, Cleanest Team Area, Best Recycling, and others. 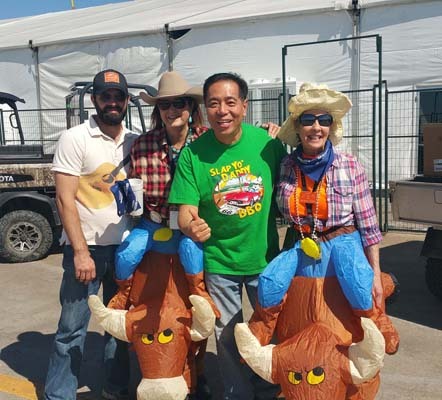 As I flew back to Los Angeles, I was happy to have made new friends and met old ones at the HLSR 2016. 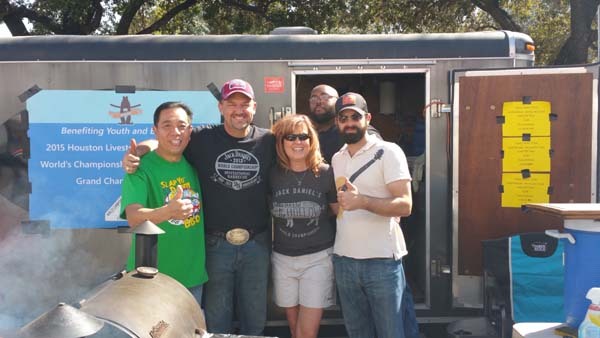 It was a fun and amazing weekend in Houston that I got to enjoy thanks to pitmaster Doug Scheiding. Sometimes in life, there is a right person, right place, and right time. That Facebook messenger note from Doug was certainly one of those special coincidences in life, or perhaps not? Only time will tell. 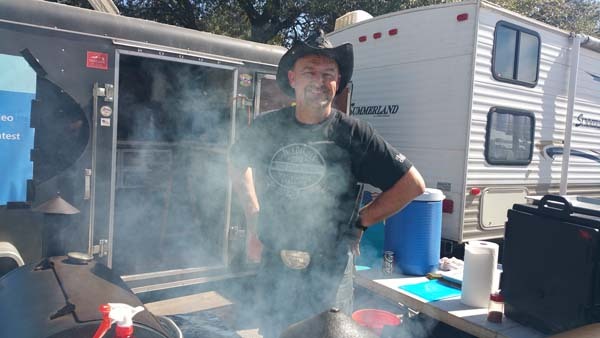 My next bucket list goal is to score a gig as a HLSR headcook on a team who is competing. 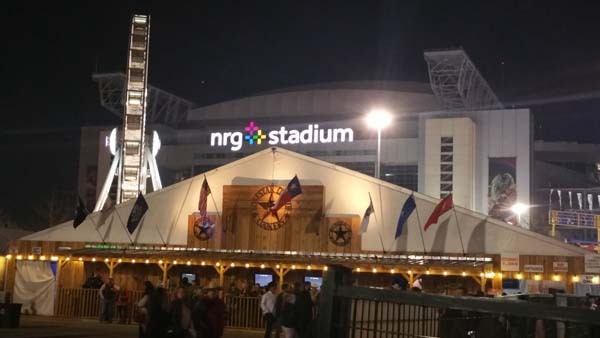 So if you’re reading this article and need a cook for your next HLSR event, give me a call!